A small invite-only alpha test began last week. 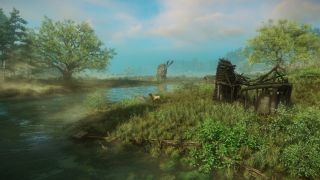 Amazon has shared a further look at its MMO New World, where hundreds of players will war over a newly discovered supernatural continent, building forts, setting quests for other players and battling over territory. Amazon Game Studios also revealed on Twitter last week that it has started inviting players to its alpha test at random, from people who signed up on the game's website. Amazon has only invited a "small batch" of testers to take part so far, which is what the Orange County studio's Patrick Gilmore told me would happen back at Gamescom. "Some aspects of the game are experimental...we're gonna test, we're gonna expand over time. It's a closed alpha, invite-only. We'll bring people in, from the sign-up list, starting this fall." If you're interested in taking part, then, you have to head to the game's Amazon page, log in and click the 'Email me' button.